RichardIII is a Legacy Library. Legacy libraries are the personal libraries of famous readers, entered by LibraryThing members from the Legacy Libraries group. » Richard III, King of England's catalog. » Richard III, King of England's legacy profile. 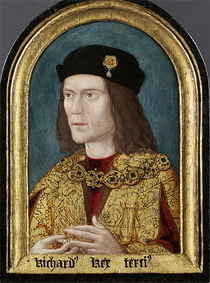 RichardIII is also an author. Historia Regum Britanniae by Geoffrey of Monmouth. About meRichard III (2 October 1452 – 22 August 1485) was King of England and Lord of Ireland from 1483 until his death in 1485 in the Battle of Bosworth Field. He was the last king of the House of York and the last of the Plantagenet dynasty. Anne F.Sutton and Livia Visser-Fuchs: Richard III's Books: Ideals and Reality in the Life and Library of a Medieval Prince, (Sutton Publishing, 1997, ISBN 0750914068).